Sweet and refreshing, easy to make, ideal for sharing during long summer evenings. 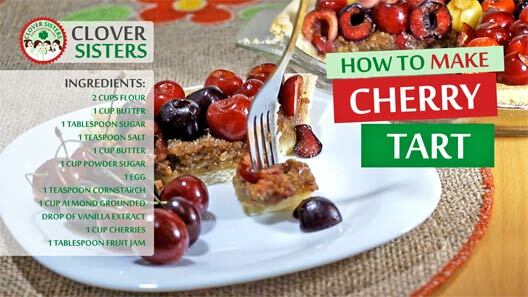 Your friends will love crusty sweetness covered by fresh cherries. Fresh cherry taste combined with almond richness makes this recipe so special. Please be kind and subscribe to our youtube channel. Thank you. 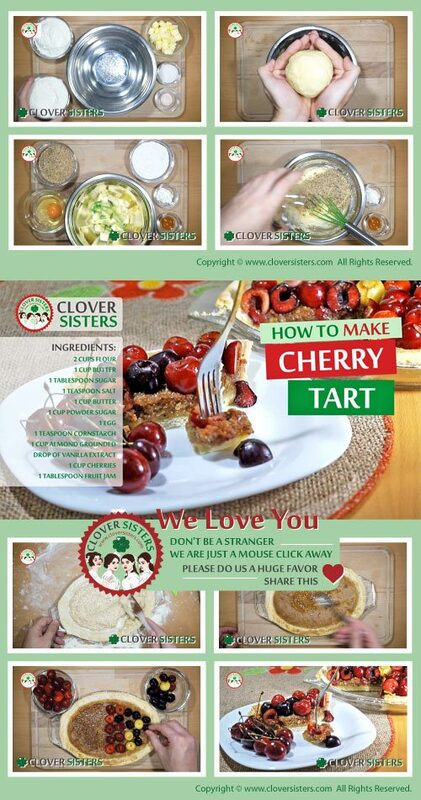 Don’t forget to share our recipe if you like it and read more of them. Thank you. Add the butter into flour amended with sugar and salt and mix it using finger tips. When it start look like large crumbs, add 1 tablespoon of water and make dough. Place it in a refrigerator for a while. Roll dough to fit pie plate and place it. Press sides with fingers and remove excess.Cream the butter then add sugar and keep whisking. When sugar is incorporated, add the egg and keep whisking. Then add the cornstarch, almond powder and vanilla extract and stir with spatula. Toss filling into crust and bake for about 25 minutes on 350 F or 180 C. Melt the jam and spread over the tart, arrange cherries around, jam will make them stick. Add some water into remaining jam and coat cherries with the jam.